As my colleague and I waited for Farhad Ghafarzade, the owner and founder of Green Drop Garage, I knew I wasn’t in an ordinary mechanic shop. A disco ball dangles from the ceiling, a pink feather boa drapes over a hook, bicycles hang up on the wall, and a whiteboard has a drawing of a car engine and its components. With friendly staff and comfy couches, it’s a place you wouldn’t mind hanging out in for an oil change. From its atmosphere to its commitment to green practices to even its owner’s journey, Green Drop Garage is different. Two weeks before Farhad was going to take the dental school exam, he decided it wasn’t for him and moved back to Portland. He knew he didn’t want to get a normal job, so he decided to earn money from a skill he had learned – converting cars to run on vegetable oil. From this experience, Farhad realized that he felt comfortable making sales and used his earnings to travel. But in 2008, Farhad bought a boat and had his first mortgage. Converting cars just wasn’t enough, so he became a busser at a new brewery in town. “It was very fast-paced. I was lucky to have a really great general manager that I learned a lot from in terms of service. So that was the final peice to the puzzle in my head. I had the technical knowledge on the cars, I could convince someone to do something, and I learned customer service,” says Farhad. Once all the pieces came together, Farhad worked on some high-profile clients and landed a full page picture and article in the Portland Monthly Magazine. Life changed quickly for Farhad, all day he would work on cars with a mechanic, at night he bartended, and in the very early hours of the morning he put together a business plan. 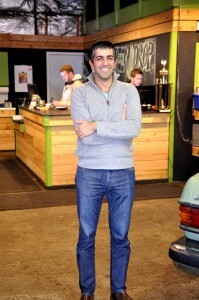 Fast forward to October 2009, Farhad opened Green Drop Garage and to date has 11 employees. His business model has changed a lot from what he originally envisioned. Green Drop Garage’s work is “99% eco-friendly car care and maybe 1% vegetable oil conversions on cars,” says Farhad. In addition, to Green Drop Garage’s unique value proposition, the company sponsors bike events, women-only clinics, and car education classes. Farhad truly has adopted a triple bottom line approach to growing and operating his business. “It’s a way of making decisions,” explains Farhad. For example, when Green Drop Garage became profitable instead of keeping the profits, Farhad decided to offer his employees health insurance and adopted a paid time off policy before the City of Portland’s PTO mandate. Farhad’s typical week is full of meetings, community and customer outreach. “I don’t do any of the day to day stuff anymore,” says Farhad. He has weekly meetings with management and sales staff, where he sets policy and direction. Farhad is active in the community, in which he is on the board of the Portland Rotary Club, the Portland Business Alliance Small Business Advisory Council, and the Southeast Advisory Committee. For him, it’s all about maintaining relationships. He also works on customer outreach and branding. Green Drop Garage is certainly a unique business. Farhad explains, “we’re a car repair shop but we’re really a service company. We don’t model ourselves after other repair shops.” Going forward, Farhad is looking to standardize what they do to expand and serve more people in the future.